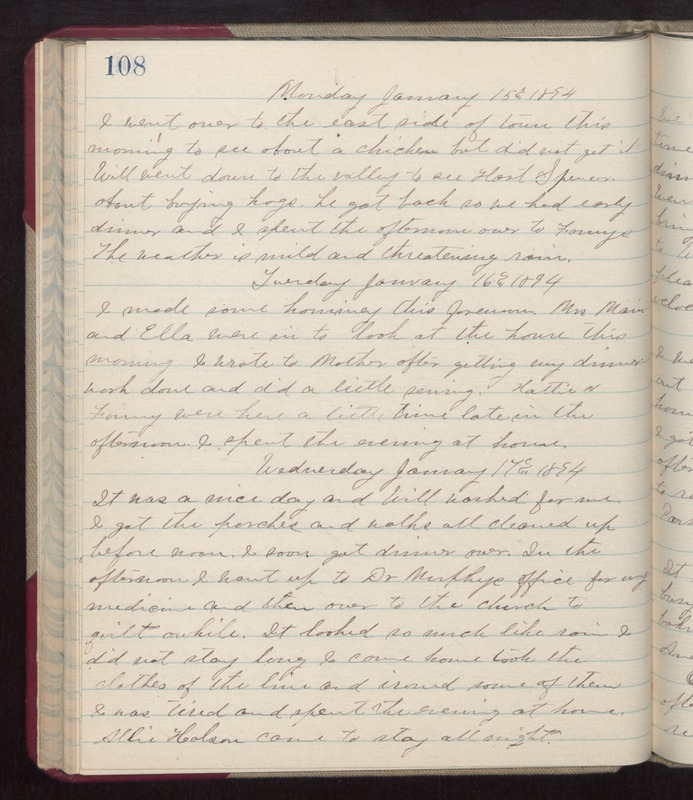 Monday January 15th 1894 I went over to the east side of town this morning to see about a chicken but did not get it. Will went down to the valley to see Hart Spencer about buying hogs. he got back so we had early dinner and I spent the afternoon over to Fannys. The weather is mild and threatening rain. Tuesday January 16th 1894 I made some hominy this forenoon. Mrs Main and Ella were in to look at the house this morning. I wrote to Mother after getting my dinner work done and did a little sewing. Hattie & Fanny were here a little time late in the afternoon. I spent the evening at home. Wednesday January 17th 1894 It was a nice day and Will washed for me. I got the porches and walks all cleaned up before noon. I soon got dinner over. In the afternoon I went up to Dr Murphys office for my medicine and then over to the church to quilt awhile. It looked so much like rain I did not stay long. I came home took the clothes of the line and ironed some of them. I was tired and spent the evening at home. Allie Holson came to stay all night.